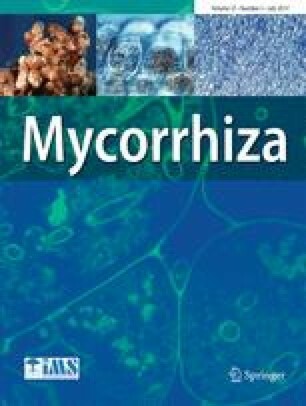 Arbuscular mycorrhizal (AM) fungi can assist their hosts to cope with water stress and other abiotic stresses in different ways. In order to test whether AM plants have a greater capacity than control plants to cope with water stress, we investigated the water status and photosynthetic capacity of Lycium barbarum colonized or not by the AM fungus Rhizophagus irregularis under three water conditions during a hot summer. Sugar levels and transcriptional responses of both plant and AM fungus aquaporin genes in roots were analyzed. Compared with control plants, AM plants increased transpiration rate and stomatal conductance but decreased leaf relative water content under moderate water stress. Severe water stress, however, did not inhibit the quantum yield of PSII photochemistry in AM plants versus control plants. AM plants had higher expression levels of plasma membrane intrinsic proteins or tonoplast intrinsic proteins and Rir-AQP2 and lower leaf temperature than control plants under dry-hot stress. Additionally, AM plant sugar levels under normal water conditions were similar to those of control plants under moderate water stress, but sugar levels of AM plants especially increased with severe water stress. When these aspects of performance of AM and control plants under different water conditions are compared overall, AM plants displayed an obvious superiority over control plants at coping with moderate water stress in the hot environment; AM plants maintained normal photochemical processes under severe water stress, while sugar levels were affected strongly. The online version of this article (doi: 10.1007/s00572-017-0765-0) contains supplementary material, which is available to authorized users. The authors are grateful to Dr. Dave Janos, the Editor-in-Chief of this journal, for his instructive advice and useful suggestions on both language and academic aspects. This research was supported by the National Natural Science Foundation of China (41671268, 31270639), the Program for Changjiang Scholars and Innovative Research Team of the University of China (IRT1035), the Shaanxi Science and Technology Innovation Project plan (2016KTCL02-07), the China Postdoctoral Science Foundation (2016M592849), and the Postdoctoral Science Foundation of Shaanxi (2016BSHYDZZ19).